Soak the moong dal morning and drain the water in the evening. Close it with a lid till next morning. Take oil into a pan and heat it fry the mustard seeds and green chili and toss this with sprouted moong and grated carrot. Add salt and lemon juice. 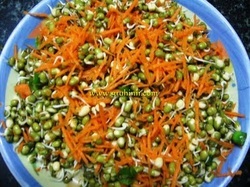 Sprouts are ready.....Garnish with fresh coriander leaves and serve. Having sprouts every morning gives lot of proteins.